This clockwise loop starts from the Pleasant Hill BART Station and goes around the foothills of Mt Diablo from Marsh Creek Rd to Morgan Territory Rd. Complete the ride with a climb up to the Junction Ranger Station at Mt Diablo via South Gate Rd. Exit the BART station onto Jones Rd and cross over Treat Blvd on the Iron Horse Trail Bridge to the Contra Costa Canal Trail. Continue east on the Canal Trail for the next 3.3 miles to Treat Blvd in Concord. Head east on Treat Blvd and meander through the residential neighborhoods on Turtle Creek Rd, Ayers and Academy Rd. Cross Ygnacio Valley Rd from Alberta Way and continue on Pine Hollow Rd to Old Downtown Clayton. Main St rolls through the Old Downtown area of Clayton with The Grove anchoring a corner of this small community. Continue SE on Marsh Creek Rd through Clayton’s neighborhoods, schools and parks to the outskirts of town. Clayton is located around the foothills of Mt Diablo with grand views of the mountain-WOW! The road exits through town pass the ranches and farms towards Rodie’s Feed. Marsh Creek Rd has three small climbs leading up to the summit at Divide Reservoir; it’s 0.9 mile with gradient ranges of 7-10%. CAUTION-watch traffic! The sweeping descent on Marsh Creek Rd leads to the turn onto Morgan Territory Rd. Morgan Territory Rd runs 14.7 miles from Marsh Creek Rd to the opposite end at Manning Rd in Livermore. The climb up to the Regional Preserve from Marsh Creek Rd is 9.3 miles. The road begins on flat terrain with superb views of Mt Diablo! The road snakes in and out of the shade with views of the dense woods surrounding Black Hills. The last couple of miles on the upper section of Morgan Territory leading to the summit of Black Hills have numerous switchbacks with steep 9-15% grades! Stop for lunch at the Regional Preserve. Morgan Territory Rd continues for another 0.4 mile to the actual summit with grades of 4.5-6%. The road runs along the top of the ridge through a small ranching community with acreage homes and ranch lands. This descent can get very fast-proceed with caution as there are many blind turns on this narrow single lane road! The views dropping down into Livermore are stunning! The road straightens out for the flat run out to Manning Rd. Continue west through the flat valley on Manning to Highland Rd. Highland Rd is a quiet back road with minimal traffic; the rolling terrain cuts through the valley with beautiful views of the gentle hills and wooden barns to Carneal Rd. Continue north on Camino Tassajara; this road has a fair amount of traffic with a minimal shoulder area-watch traffic! Camino Tassajara rounds the bend and enters the suburbs along the outskirts of the Blackhawk community. Turn right on Blackhawk Rd and continue through Green Valley along the tree-lined gated neighborhoods around Blackhawk. Turn right onto Mt Diablo Scenic Blvd; this road climbs up along the private community of Diablo pass the Athenian School towards the South Gate Entrance into Mt Diablo State Park. The road continues snaking its way up the side of the mountain and levels out when you round the curve to the South Gate Entrance Station. Descend North Gate Rd and exit through the North Gate Entrance to Oak Grove Rd. Follow the bike route from Walnut Ave to El Divisidero and go around the neighborhoods on San Antonio Dr to San Carlos Dr. Continue along the Canal Trail from Heather Farm Park and return to the BART station on the Iron Horse Trail. 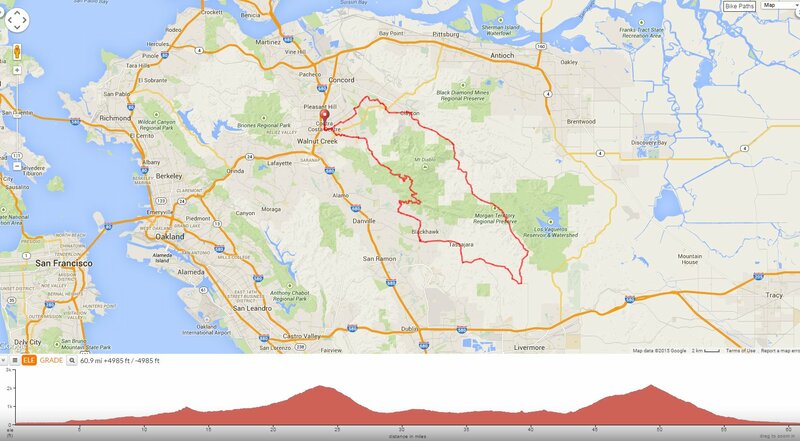 This is a fantastic hilly loop around the foothills of Mt Diablo! You’ll enjoy the quiet remote back roads and scenic vistas on the way up South Gate Rd! Weather: Sunny and warm with clear blue skies. Temps ranged from the high 50’s to the low 78’s with NW winds.